Unfortunately, we see about as much death here as we do new life, especially in the spring. 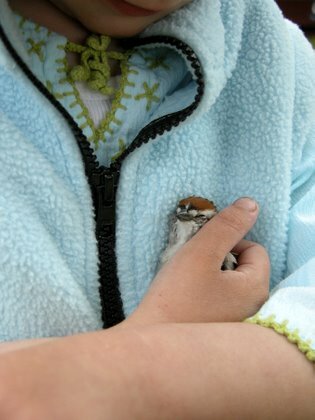 We had two esteemed visitors last weekend and were taking them on a farm tour when we found a foundering chipping sparrow. Poor thing. Even though we told her she shouldn’t touch it, The Budding Naturalist had to touch it as you can plainly see. We buried it later. “I’m going to miss that little guy,” said she. It looks like the little guy was happy before it died though. And there’s no question it was loved.